Multiple personality disorder [MPD] and possession trance [PT] are examined from the perspectives of presenting morphology and demographic epidemiology. The goal is to ascertain whether at these levels MPD and PT are disparate phenomena, or warrant treatment as two instances of a single type. 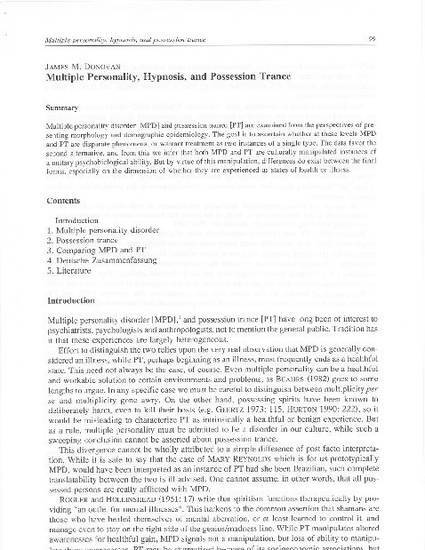 The data favor the second alternative, and from this we infer that both MPD and PT are culturally manipulated instances of a unitary psychobiological ability. But by virtue of this manipulation, differences do exist between the final forms, especially on the dimension of whether they are experiences as states of health or illness.